Don’t get me wrong, I like lettuce. And rocket. I grow prodigious amounts of both, and eat most of it. It’s just that if there is none, I am never lost for salad ingredients. And when there is, I augment the tender crispness of lettuce and the bite of rocket with a host of other favourite ingredients from the garden and hedgerow. In spring and early summer, there is a wide choice of tender green leaves. Garlic Mustard, with big heart-shaped leaves, appears early obligingly self-sown in odd corners of the garden. Mildly garlicky, with a gentle bite of mustard. Our accidental pole of a lime tree (kept as a pole because there’s no room for a tree) produces the most succulent unfurling leaves before any lettuce is ready. Young shoots of Bishopsweed transfer from the weeding bucket to the plate via a good wash. Then the Sorrel family – Common and Buckler-leaf – provide sharp, lemony, bulky leaves – shred them to mix that sharpness through the salad. Sweet Cicely for a hint of aniseed. Rampion, an edible Campanula, produces a mass of tender leaves. Claytonia, or Miners’ Lettuce, which I’ve picked right through winter from the greenhouse bed, is joined by its cousin the Pink Purslane. New leaves of Wood Sorrel, looking like clover but with delicate white flowers, are found in the woods. It’s a refreshing appetiser when nibbled on a walk. For crunchy, succulent foliage, try the long linear leaves of Bucks Horn Plantain – branched at the ends like antlers. Or the round, slightly bitter but always tender leaves of Orpine, a native Sedum whose flowers bring out bees and butterflies in late summer. As summer progresses, I add sweetly aromatic herbs to the salad bowl, chopping them finely to disperse the subtle aroma and flavour. My favourites are Golden Marjoram, Lemon Balm and Mint – but not just any mint. One of the citrus varieties – Orange, Lime or Lemon Mint, or Basil Mint, or best of all Eau de Cologne Mint. A little goes a long way! Basil itself, of course, contributes a domineering flavour, good with tomatoes. Judicious amounts of Chervil, Summer Savory or Dill with its cucumber tones can all be added. Salad Burnet or young Borage leaves taste similar. Yellow Primroses, Ramsons from the woods and Cornflower petals are the first edible flowers to be added; later blue comes from borage flowers. Wild Pansies, bright orange Calendula, sweet white petals from my Jacobite Rose and gaudy Nasturtiums taste as good as they look. If I can stand to sacrifice them, I’ll eat Hemerocallis (Day Lily) flowers too, and the ones from my Clove Pinks. 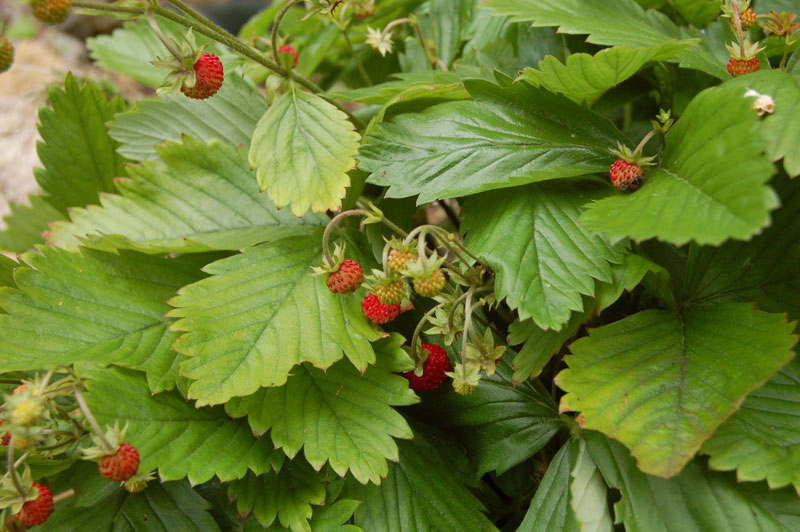 By now, wild strawberries are getting scattered over the salad bowl, and as summer wears towards autumn, fruit starts to dominate. Anything goes. Whole raspberries, blaeberries and whitecurrants; chopped red gooseberries; peaches and grapes from the greenhouses; brambles and elderberries and onwards till I am confronted by the autumn apple mountain – a source of material for my less frequent winter salads. Nuts go well with apples; wild hazelnuts and walnuts from my neighbours’ tree, well-chopped. Now I will use the pickled ash keys I made in June and other preserves to spice up a winter salad. Greens come from the greenhouse – hardy winter Lamb’s Lettuce, Claytonia and hot Land Cress. Dried fruit, whether home-dried wild strawberries or conventional shop ones, I add liberally. Salad Days may be over, but salads go on even in the depths of winter, till spring comes round again. We’ve been entertained since last weekend by a huge caterpillar on the willow herb outside the kitchen window – an elephant hawk-moth. S/he is still there, on the second full stem which is being systematically stripped of leaves, but is getting fatter and slower. The cat is scared of it. We also had visitors, Tim and Gill and their daughters Lucy and Alice, and as is customary they were pressganged into picking blaeberries (bilberries). This absorbing task yielded enough of these tasty and nutritious fruits for jam, cakes, puddings, breakfasts and the freezer…. and there’s plenty more if we are back in the right habitat, which is acid woodland. Lucy was quite revolting with her blaeberries – squashed them to a mush in their plastic bag, bit off the corner of the bag and sucked the pulp out. Ugh! Fruit Smoothies the rustic way I suppose. Tim and Andrew were sidetracked by some nice big chanterelles, and Tim and I collected honey fungus on the way back – a big show of these and more to come. They were delicious in omelettes. There are a few other mushrooms about just now – several of the Russual genus are showing their faces, but not enough to get a selection of edible species, and in the Millenium Wood Tawny Grisettes (much chewed by slugs) mix with The Blusher (Amanita rubscens). We don’t eat the Blusher. It’s said to be edible, but a. it looks a bit like the poisonous Panther Cap which is also about just now and it wouldn’t take much of a deviant Panther Cap to get mistaken and b. so many creepy crawlies have already eaten it by the time we get there anyway. Hazelnuts are swelling and becoming obvious in our local copse. We had a ridiculously wonderful week’s holiday in Orkney. Expecting windswept, wet and cold marginal land where nothing grows, but instead found fertile, weather-rich (every kind in a day) and unique countryside, wrapped in glittering sea and sky, nice cheese, good beer, bere-barley bannocks, and Andrew, bless him, even found an apple tree with apples on within minutes of getting off the ferry (reported, doubtless with pictures, on his website www.appletreeman.co.uk) . There were plenty of seaweeds to choose from – bladder wrack, serrated wrack, sea lettuce, kelp (Laminaria digitata), sugarweed (Laminaria saccharina) and gutweed (Enteromorpha intestinalis) for starters! Most seaweeds are cookable when camping, even with our primitive trangia, because all they need is a wash and a rapid stir-fry. I do find the filmy ones easier, though, because you don’t need to cut them up. Wish we were nearer the coast at home, then I could experiment with different cooking methods. Orkney is famed for its fish and seafood, and although we had to buy them, it was a wonderful near-neolithic experience picknicking on a beach by a prehistoric village on dived native oysters (Ostrea edulis) with Orkney oatcakes. Thanks to the oyster man for lending us his oyster knife! Rose-root (Sedum roseum), clinging to the steep, deep edges of a GLOUP (basically a huge pit in the cliff due to the lower strata caving in). I have rose-root in the garden and sell it, but have never seen it in the wild before. The same is true of Scots Lovage,, which I was thrilled to find sprouting freely on the shingle beach below the campsite. It was delicious – stronger in flavour than my garden specimen. Annoying how it obviously seeds itself merrily on a stony beach, but can I get the seeds from mine to germinate? And on the same beach, one I’d only ever seen in books, the Oysterplant (Mertensia). With blue-grey, succulent leaves, and azure blue flowers, this member of the borage family is rare in the wild, and you wouldn’t dream of picking very much of it even though it was plentiful on this beach. It is absolutely beautiful. It is so named because the leaves are said to taste of oysters. I love oysters, as you’ve heard, and if you’ve never had one, imagine a taste that is the smell and lazy feel of dipping in rock pools on a clean coast on a warm, summer’s day. 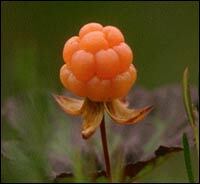 A plant that tastes like that? Be assured, the Oysterplant really does! The wildest thing I saw in Orkney was coming back from Eday to Kirkwall on the ferry. It was a hot, sunny evening, the sea calm and sparkling. I stood on deck and shut my eyes, just enjoying the sunshine and the peace and sea-smells. When I opened them, a minke whale surfaced and went down, up a few more times, then gone. I’d never seen a whale before. What can you say. It was magic. Alternating heavy rain and warm sunny days have prodded the first fungi of the season into appearing. We have a pretty ring of nondescript brown mushrooms on the lawn, but I don’t eat nondescript, because of the risk of misidentification. No such risk with the Dryad’s Saddle (Polyporus squamosus) which has appeared very conveniently on the end of a log I’m using to edge the soft fruit plot. This large bracket fungus with its distinctive beige scaly top and white flesh is very good when young, meaty and substantial. We had it for breakfast; being greedy I didn’t want to waste the stem part but that was a mistake, as it’s far too tough and chewy to bother with. I’m hoping this tree fungus will continue to crop through the summer. And this weekend we came upon – and ate – our first chanterelles of the year, near Dunkeld. They were at a very young stage, but plentiful and delicious. I am still using last year’s dried chanterelles and Boletus, so that’s availability 12 months of the year. Just like my spinach beet. If I could live on fungi and spinach, I’d never have to go near another shop! Well, let’s be honest, I probably could, but having gone through the Lent thing, I’m glad I can find and/or grow plenty of other things too! The Lent challenge has left me with distinct squirrel tendencies…. I am worrying myself silly that I’m growing enough beans and peas for drying, have tucked two big bottles of elderflower cordial in the freezer already for winter use, and have potatoes growing everywhere, including the compost heap. It’s a bad year for carrots though, and also we’ve noted it’s an off-year for the ash trees of Perthshire. Normally I’d have made ash-key pickle by now, but there are none…..
August – Weeks 1, 2 and 3. More chanterelles, more wild cherries. We think it’s odd that the several fairly old cherries in a hedge line from which we gather the fruits all seem to produce fruits of varying sweetness and colour when ripe. One is almost black, another, barely red. All delicious, though. Any theories, anyone? One long walk on 10th produced in addition to a sack of chanterelles, Plums -and-Custard mushrooms (Tricholomopsis), Birch Boletes and larch Boletes, and tawny grisettes. The chanterelles from this trip we dried, by threading them onto cotton and hanging them as garlands in our warm shed. When they are nearly dry I will de-thread them and spread them on trays over the boiler to finish before putting them in tightly sealed jars for the winter. On the 11th, I macro-foraged! In that I went sea angling from Arbroath with friends, and caught 7 big mackerel. I hadn’t been before and must admit the sea was choppy and a tad nauseous, but I got over it and would definately like to go again. As my friends were going on holiday the day after, I managed to “forage” (borrow? steal?) 5 of their fishies too to make a round dozen which I have cleaned, filleted and frozen, or eaten. The same day, Andrew brought home a bag of field mushrooms he’d found at work, which I turned into a delicious soup. Then we went on a week’s holiday to Norfolk, and got to try out some wild foods on Andrew’s unsuspecting (or suspecting?) family. At Holkham Beach we gathered samphire, oh how I love samphire and it especially nice after being exiled from this East Anglian delicacy for a couple of decades. Steamed for 15 minutes and tossed in butter, this unprepossessing-looking product of mudflats with its fleshy, salty stems is incomparable. We didn’t gather any more, no-one seemed that enthused except us, but perhaps we shouldn’t have inflicted the seaweed Sea Lettuce on them in the same meal. Filamentous pale green sheets you’d think wouldn’t take much to cook, but in fact it was a bit chewy. Next time I would make more of a meal of it, with some flavouring, longer cooking, combined with mushrooms perhaps…. not really a side vegetable with roast pork. The apple sauce, though, was made with a combination of wilding apples from the hedgerow, “scrumped” eaters from an abandoned garden, and wild water mint, and it went very nicely. Likewise, we all enjoyed (I think that’s the word) the mind-banditing sharpness of Sea Buckthorn berries growing on the dunes near Old Hunstanton, and Andrew brought the pips home in a hankie…..
We kept a supply of fungi going through the week – puffballs, horse mushrooms, grisettes etc. – some of which were appreciated, the rest we just ate ourselves. I was specially excited by the Roman mushrooms – found while exploring the site of a Roman fort at Brancaster. Resisted some big Parasol Mushrooms (Lepiota procera) at Wretham Heath – after all it was a nature reserve – look forward to finding some more before the summer’s out. Back home, we realised the fridge was empty so went out after more chanterelles and found, in addition, an absolute HORDE of Boletus edulis, the Cep or King Bolete. However, most of them were coated in white and contorted or deformed in a most sinister looking way. We think – but please educate us if you know better – these specimens had been affected by the torrential rain which had obviously been plaguing Perthshire in our absence and fallen foul of some predatory fungus themselves. Luckily there were some good specimens, as well as a variety of other boletes and the first Slippery Jacks. We have cleaned, sliced and set these to dry for winter, but the Ceps are for tea tonight. While out we snacked on some lovely little wild gooseberries, and checked the progress of rowan berries in general.